One of the favorite games here in our Michigan office is to imagine how our creative customers will put their new backdrops to use. It is easy to let your mind wander when you open a customer’s artwork file for a new scenic stage set and see images of fantasy forests, magic theaters, train cars and more. Heck, even a simple step-and-repeat design with a company logo can immediately invoke images of flashing cameras on a red carpet, exciting press announcements, or endless smiling selfies. Sometimes customers are kind enough to share photos of their backdrops in action at their shows and events. Our staff always gets excited when these photos come in. We put a lot of energy and time into every custom product we produce, so it is almost like getting a photo update from a kid you sent off to college. “Hey did you see the pic of the project we did for….” is a typical conversation starter with our office staff and production team. The project stood out for us in a few ways. First, the artwork is very well done. The scale of the graphics is appropriate for the size of the show and the number of characters on stage. The backdrop graphics include bold lines and a bright color scheme. The artist had worked fun detail into the scenic design, without being overwhelming for the audience. Secondly, it physically stands out, as the entire set stands 28 feet wide and 10 feet tall. The three different sections provide the show with the flexibility to arrange the backdrop sections to fit various venue sizes. They can even create stage "wings" in spaces with limited or no backstage space. 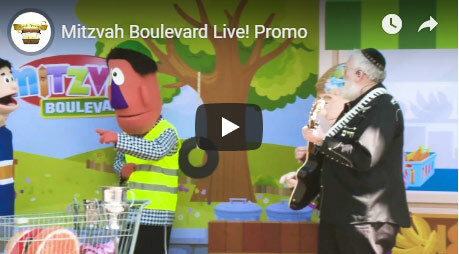 If you would like to learn more about "Mitzvah Boulevard Live", and the see their colorful and fun stage set design in action, you can visit the official "Mitzvah Boulevard Live" website or watch the show preview video on YouTube. If you have a photo or video of your Shows To Go Backdrops product in action, we would love to see it. You can post it to our Facebook page, tag us on Instagram, or email it to us.